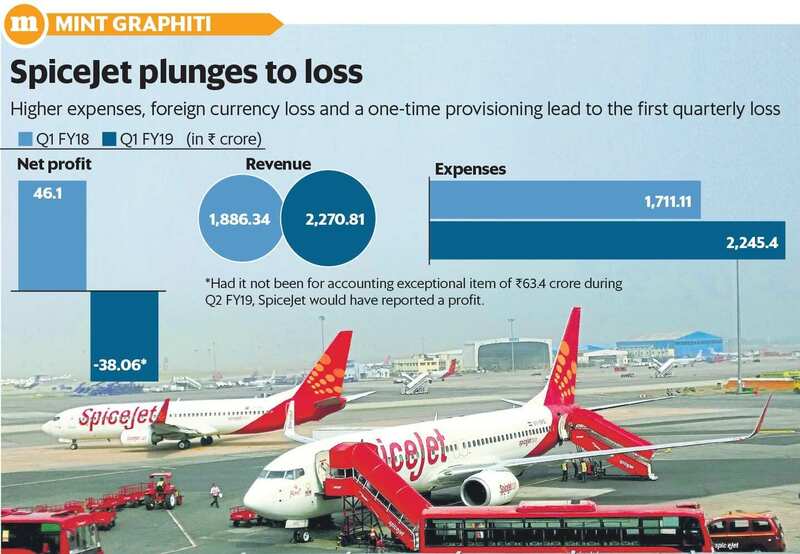 Mumbai: SpiceJet Ltd posted an unexpected first loss in 14 quarters weighed down by a one-time expense, higher fuel prices and a foreign currency loss. The budget airline—controlled by entrepreneur Ajay Singh—plunged to a loss of ₹ 38.06 crore in the three months ended 30 June, from a year-earlier net profit of ₹ 46.1 crore. A Bloomberg poll of five brokerages had forecast a profit of ₹ 103.8 crore. Higher expenses, foreign currency loss and a one-time provisioning led to the quarterly loss, SpiceJet said on Tuesday. The past two quarters have seen domestic carriers hammered by higher jet fuel prices, a weaker rupee and intense competition hindering their ability to raise fares sufficiently to cover the higher costs. Profit at IndiGo, the largest domestic carrier by market share, fell by a record 97% in the June quarter despite an increase in passenger traffic. On 10 August, Jet Airways (India) Ltd deferred issuing its June quarter earnings, saying the chairman of the audit committee had informed the board that the management needed further time to finalize the accounts. A spokesperson said a fresh date for the quarterly results will be announced soon. SpiceJet, India’s second largest budget airline, incurred a 54% jump in fuel expenses to ₹ 812.44 crore in the June quarter. It also made a forex loss of ₹ 51 crore last quarter due to a depreciating rupee. Revenue grew 20% to ₹ 2,270.81 crore in the June quarter thanks to a 14% rise in domestic traffic to more than 4.25 million passengers. Expenses jumped 31% during the period to ₹ 2,245.40 crore. “The company has taken a provision of ₹ 63.5 crore as an exceptional item on account of an arbitration award that cited interest payable of ₹ 92.5 crore and interest receivable of ₹ 29 crore for SpiceJet," the airline said in a statement. “With this one-time provision, SpiceJet has now fully provided for the maximum amount that may be payable under the arbitration award," it said. The payment was toward legal proceedings against erstwhile promoters Kal Airways Pvt. Ltd and Kalanithi Maran. SpiceJet could have posted a net profit had it not been for the forex loss and one-time provisioning, said a person close to the airline, who didn’t want to be named. The airline could have deferred the provisioning for arbitration to the next quarter and posted a profit in June quarter, the person said. The carrier, however, decided against the option as the September quarter is traditionally a lean period for air travel, which may also hit the financial performance more than in the June quarter, the person added. SpiceJet’s yields rose 4% to ₹ 3.84 (per person per km) in the June quarter while capacity grew 14%. The carrier filled 94.53% of its seats on domestic routes in the June quarter—the highest among local carriers. “SpiceJet has delivered yet another operational profitable quarter despite surging oil prices and a weak rupee," said SpiceJet’s chairman and managing director Ajay Singh. “As we start inducting the new fuel-efficient B737 MAX and the Bombardier Q400, we will be able to significantly reduce our overall costs even as we aggressively expand our network both in India and overseas," Singh added. Rising jet fuel prices and a depreciating rupee against the dollar have swelled operating costs of airlines as the bulk of payments are dollar-denominated. The benchmark Brent crude price surged 40.54% in the past 12 months. The rupee weakened 8.21% against the dollar in the same period.